Nowadays restaurants are readily incorporating with Online Food Ordering Android App mobile application to make over the profitable business to everywhere by delivering the services to the customers with favorite recipe, the people are started to buy their food items from their favorite restaurant with easy ordering and delivering so, it is the best opportunity for the hotel vendors to collaborate their business online with our user-friendly mobile application. We have integrated the latest features and functionality on the app, with the advanced limitations of the options and managing facility. To be unique and stand alone in your business with smart about the implementation of your business is the best revenue process so we have developed this Food Ordering App. Our Advance Food Ordering App is designed with different portals where the customers can register their account with the valid mail id and password, after the successful log in to the system at the center of the home page they can find the listings of the hotels which are listed and also we have integrated the restaurant quick search functionality to make the process more user responsive and quick. The users can add the product to the cart or favorite where they can make later use of it. We have also included the user management, order management and checkout management etc in the user page to make a user more efficient in ordering the food. The Food Delivery Android App has the vendor portal where the hotel vendors can register their account with the mail id and password, they can list their restaurant menus, offerings, and other features with simple user-friendly customization. The vendor can accept or decline the order requests, once accepting the order, delivery request sent to all nearest delivery persons. After delivery person arrival, the vendor needs to verify the OTP from the delivery person then give the order. It is the best way to see the reports and managing resources. We have also included separate delivering portals for the delivery service providers where they can log in and can sign in their account with the name, phone number and vehicle details. To avoid the duplication driver need to upload the photos of the required documents for verification. The driver can make him available by clicking switch button in the top of the page when he is not in delivery. At the bottom of the page, the driver can see the total number of deliveries completed and the total amount received in a current day and overall deliveries management. After making the delivery to the ordered customer, the users can give feedback services to the service provider and also for the restaurant. 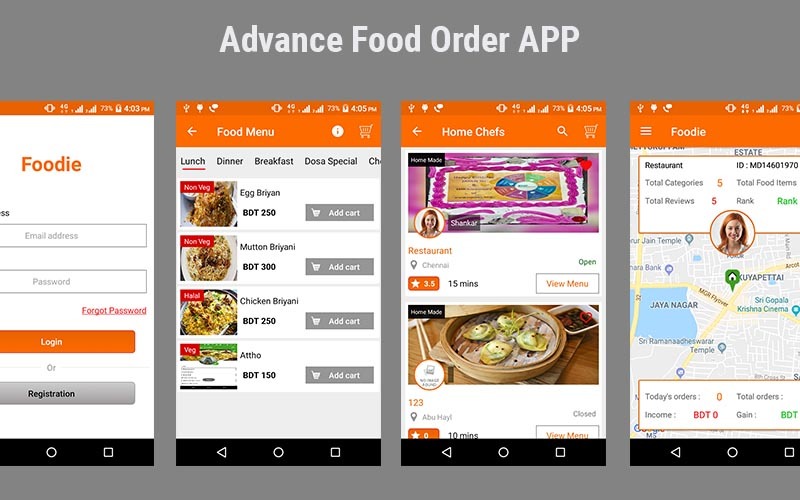 We are sure that this Online Food Ordering Android App will replace the trademark among the leading business entrepreneurs to lead their business in a successful way. Based on your needs you can buy anyone license types like Single Domain, Multi-Domain or Multi-Domain With Reseller. One time Payment:- Once you send the full payment we will give you the entire script files to you, thereafter you don’t want to pay anything.